In the following post, you will find the best Magento 2 gift card extensions that are now available in the ecosystem. 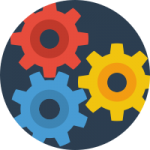 More and more vendors offer this kind of modules, but below you will see only the most reliable solutions. For each Magento 2 gift card module, we provide a small overview of features. For further information, check the full review or proceed right to the official extension page. To make the long story short, let’s describe how the Magento 2 Gift Card extension by Amasty works. After a customer purchases a gift card, the appropriate code with a message is sent to the addressee. Everything happens within just a few clicks in case of online gift cards. If you use offline variation, the process of sending takes a little bit more time. Note that the Magento 2 gift card extension by Amasty allows buyers to select the value of each certificate. In your turn, you can provide customers with cards with fixed values or let them select their own values custom one. 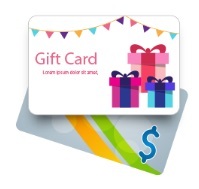 Note that a card image and a gift message may be customized, so each gift card may be unique. To make the delivery more precise, the Amasty Gift Card Magento 2 extension allows specifying a dispatch date and a time zone. If you are a recipient the functionality of the extension is even easier. 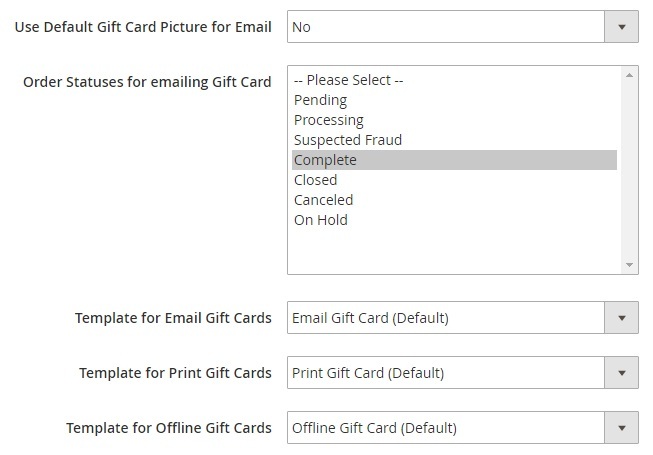 Just copy the received code and paste it into a card field on an e-commerce store where the card was purchased. This will increase your current certificate balance which is displayed in a customer account. An unlimited number of codes may be applied. Note that you can easily delete empty certificates as well as view the current balance and the expiration date of each gift card. 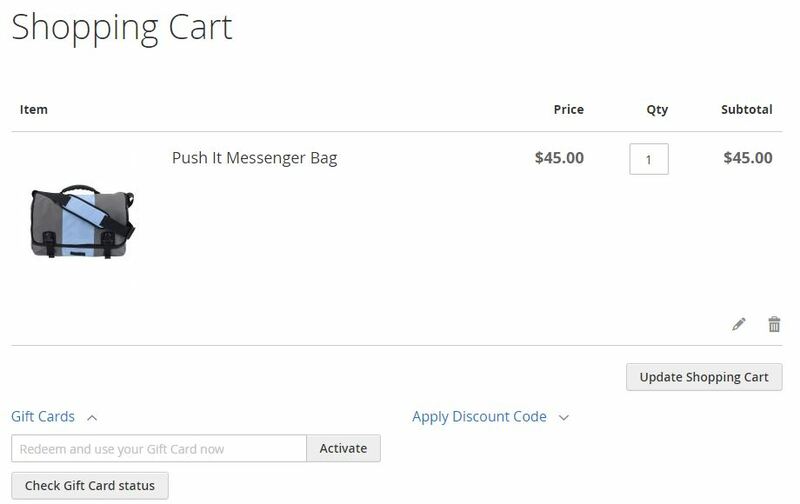 And this is possible not only on a customer account page but also in a cart, where you can apply codes as well. 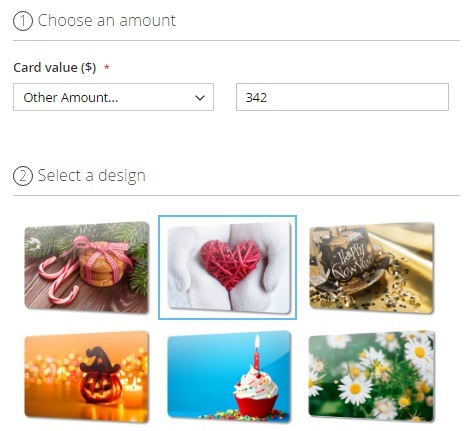 Due to wide customization options, your customers can create absolutely unique gift cards every time they want to congratulate someone. The Magento 2 gift card extension by aheadWorks allows specifying card value, design, and message. Note that all cards are responsive, so they are displayed equally well on all screen sizes. 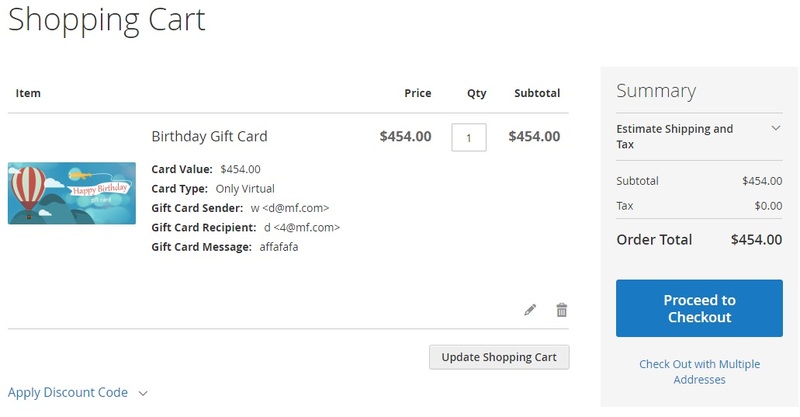 The module lets you create virtual, physical, or combined gift cards. You can specify both fixed and free value options for each card. In the backend design options, it is possible to make a selection of predefined email templates. Let’s describe the three gift card types mentioned above. In case of the Email type, a code is sent to the recipient’s inbox and appears there within minutes. Print-At-Home cards require more time to be created. The buyer purchases the card and prints it at home or in a copy center. Next, the card is gifted to the recipient. The longest way is represented via the third type – Sent by Post gift cards. The name of this gift card type is quite self-explanatory, so we are not going to waste your time with their description. 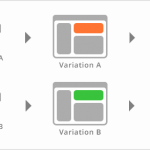 At the same time, you can provide your customers with two types of pricing. 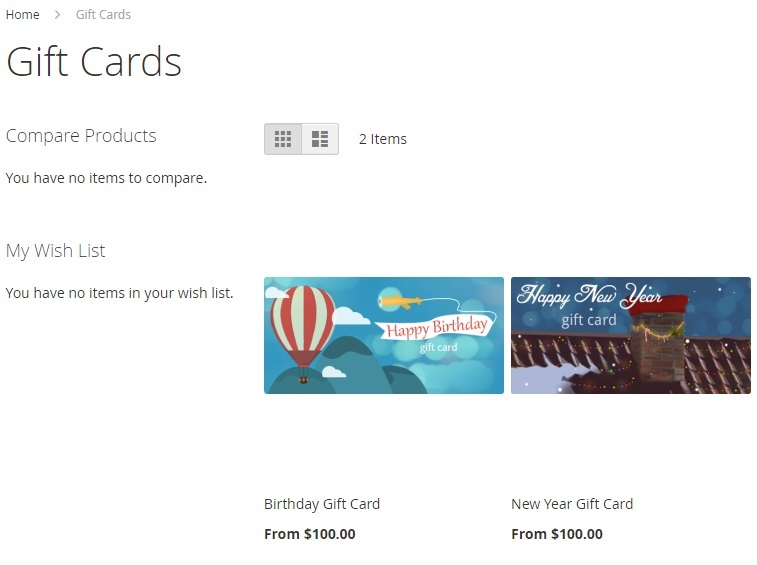 They can choose between gift cards with fixed or variable values. As a store administrator, you can set a drop-down with predefined prices or a price range. To redeem the gift card value, it is only necessary to enter a unique card code. The appropriate field is available on both cart and checkout pages. 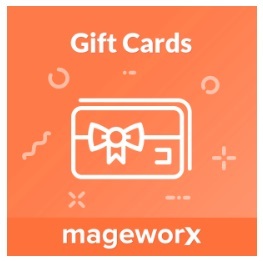 Note that the Magento 2 gift card extension by Mageworx allows spending the gift card balance for multiple transactions. 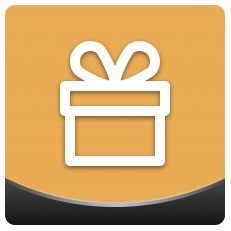 Install the module and you will let store visitors buy gift cards and send them as presents. We’ve just mentioned that you can provide several gift card types (physical and virtual) with flexible or fixed price. Besides, the Magento 2 gift card module allows creating personal messages and choosing preferred images for any template. Consequently, you provide customers with the ability to be creative. And since everything can be previewed before adding a gift card to a cart, the number of mistakes is dramatically reduced. From the perspective of a Magento administrator, the MageDelight Magento 2 gift card extension allows tracking the usage of every gift card as well as a gift card status. 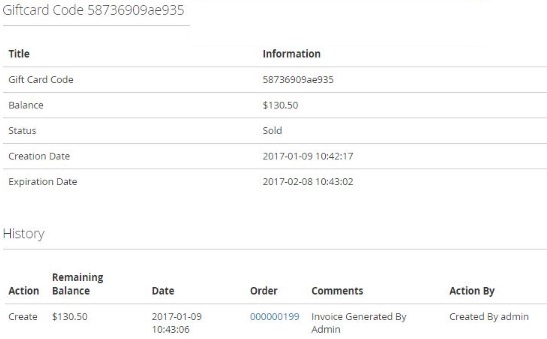 The same functionality is added to the appropriate tab of a customer account. Here is the backend History section that illustrates the usage of gift codes. 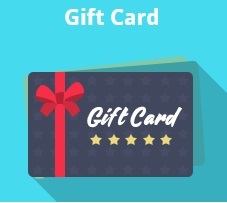 All gift card products are gathered in a grid that displays such parameters as product ID, thumbnail, name, type, attribute set, SKU, price, visibility, status, and website. You can edit each product individually. Now, let’s take a look at the frontend appearance of the Magento 2 gift card extension by MageDelight. 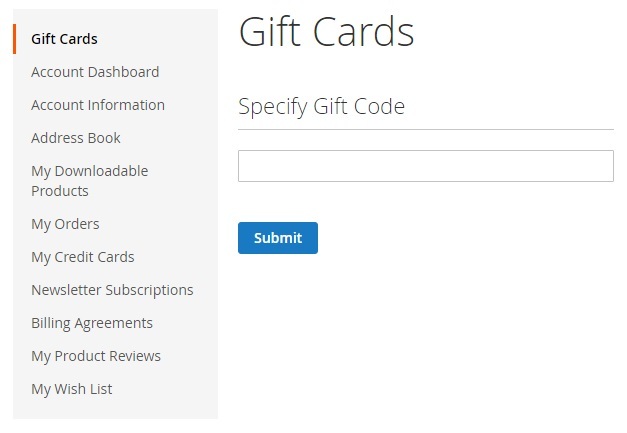 The category page with gift cards provides a user-friendly interface with one very important improvement. 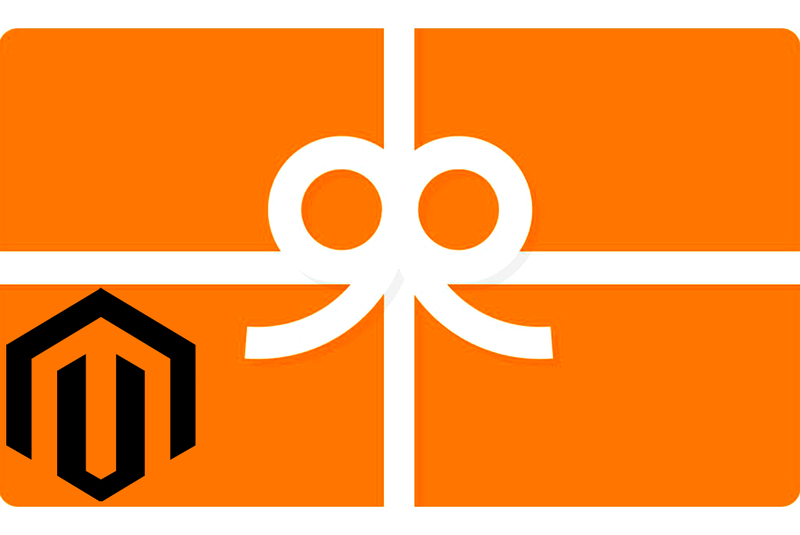 With this Magento 2 gift card module, you get a robust filtering option. As a result, your clients can discover the desired gift card with ease. It is possible to filter out the selection of items by gift card balance, maximum or minimum price, and price type. As for the gift card product with a price range, it allows specifying any value within the existing price limits (minimum and maximum ranges). Additionally, every gift card page displays the period of validity as well as provides the ability to choose online or offline sending mode, specify sender and recipient name/email, and leave a message. And it is possible to send multiple gift cards simultaneously. While in a customer account, you can interact with the Magento 2 gift card extension via the appropriate tab. You can rapidly check the gift card information by entering a gift code. We’ve just described the most robust gift card extensions for Magento 2. Which one is the best? What module would you recommend to others? If you still don’t know the answer, check our comparison: Magento 2 Gift Card Extensions Comparison. 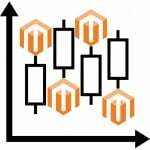 Besides, we recommend you to read the following posts: Magento 2 Extensions For Advanced Discounts And Promotion Rules and Magento 2 Gift Registry Extensions.